friends and all people that are precious to You. amounts of energy and bright new ideas for the future. We are kindly informing that from 16th April 2018 y. LfC company will change address for correspondence. 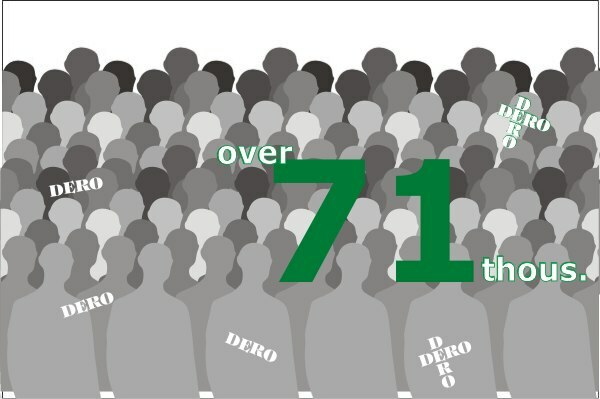 Impressive number of surgeries with use of DERO implants. LfC has been cooperating and supporting the Polish artist Michał Bajsarowicz ​since​ many years. Thanks to fruitful contacts with “Brussels”, with the help of our friends, especially Professor Marek Szpalski, we managed to prepare an extraordinary vernissage of Michał Bajsarowicz’s art. The ​opening of the ​artistic event t​oo​k place in the prestigious surroundings of the Sofitel Brussels Hotel on ​October 17th and will continue until December 15th, 2017. The 18th Israel Spine Society Meeting was held on April 26–29, 2017 in Eilat, Israel. At the invitation of N. Knoller, President of the association, LfC came to participate in the meeting with an economic mission which included distributing the latest generation of 3D Ti-Truss implants, establishing contacts with Israeli surgeons and supporting MFAST, a long-term distributor of the DERO Spinal System, with marketing activities. Professor Knoller welcomed the LfC delegation warmly, emphasizing the President, Mr. Ciupik’s commitment to the development of spondylosis surgery worldwide, and to the cooperation between Polish and Israeli spinal associations. DWG 2016 – biggest congress of German spinal surgeons and one of biggest in Europe – took place between 1st and 3rd of December in Hannover. 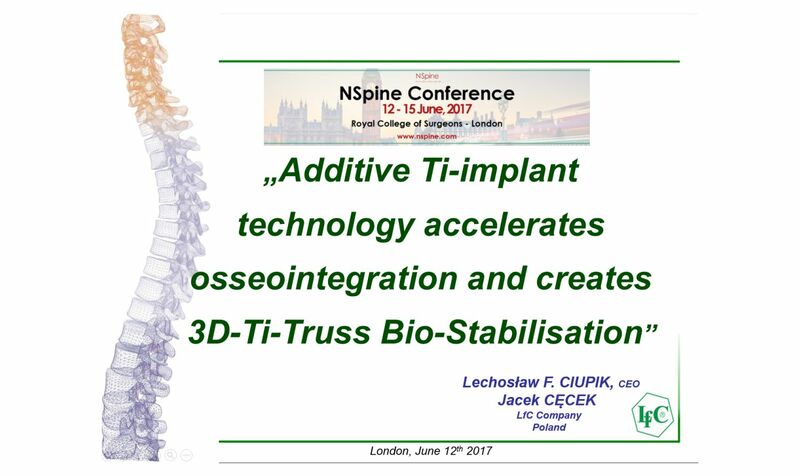 ​LfC in cooperation with its German partner Via4Spine successfully presented medical technologies from Zielona Góra dedicated to spin​al surgery. This year we are celebrating LfC’s 25th anniversary, which coincides with the 25th anniversary of Poland’s freedom. LfC is a company created from nothing, in harsh socioeconomic conditions; however, since the beginning of its existence the company has been making ambitious progress. The company’s success is a result of vision, inventiveness, persistence and determination in action. LfC engaged in producing surgical equipment used in spinal treatment in orthopaedics and neurosurgery. Ever since it was established, the company’s focus has been on the needs of highly competitive and demanding world medical market. LfC in Liverpool. The city of the Beatles attracts spine surgeons. Between 1st and 4th October 2013 spine surgeons from all over the world gathered at the EuroSpine 2013 Congress in Liverpool. As has already become a tradition, for the tenth time the LfC Team, this time with more surgeons from Poland, took part in congress sessions, exhibitions and discussions on improving the methods of surgical spine treatment. The Ministry of Regional Development has prepared an atlas in Polish and English language version, summing up the activities undertaken within the Operational Programme Innovative Economy. The most inspiring examples of the OPIE projects from all over Poland have been presented. LfC was distinguished as one of the two companies in Lubuskie Province. In the opinion of the MRD, LfC’s effective research and development activity is a model example of implementation of new R&D ideas and supporting Polish innovation. Between 6 and 8 December 2012, LfC company participated in the 7th German Spine Conference/DWG in Stuttgart. LfC presented its latest achievements in spondyloimplantology. XIXth BISS „Complications in Spine Surgery”. Expert activities of LfC group. From 9 to 10 November 2012, LfC company participated in the Brussels International Spine Symposium (XIX BISS). The symposium is organized every year in Brussels by prof. Robert Gunzburg and prof. Marek Szpalski, spinal experts collaborating with the company for years, and attracted many spinal specialist from all over the world. Between 11 and 13 October 2012, 4th International Congress of the Polish Society of Spinal Surgery took place in Zakopane. LfC company marked its position again at the conference. The company presented current potential regarding cutting-edge spinal treatment methods using DERO implants and took part both in the exhibition, organizing specialist workshops, as well as presentations during scientific sessions. On 21 June 2012 in the Staszic Palace in Warsaw, the seat of the Polish Academy of Sciences, LfC company was again in the first place in the ranking of the „Most Innovative Small and Medium Enterprises in Poland in 2010” and the second place in the „500 Most Innovative Enterprises in Poland in 2010”.